Plavecké Podhradie is a village and municipality in western Slovakia in the Malacky District in the Bratislava region.HistoryIn historical records the village was first mentioned in 1247 AD.GeographyThe village lies at an altitude of 256 metres and covers an area of 21.188 km².PopulationOn 31 December 2011, it had a population of 686 people.SightsThe Plavecky Castle and few caves in the Little Carpathians are located nearby.Plavecky castle (remains)Original Castle was built in the 13th century. Middle part consisted of gothic castle:rectangular tower and the palace. 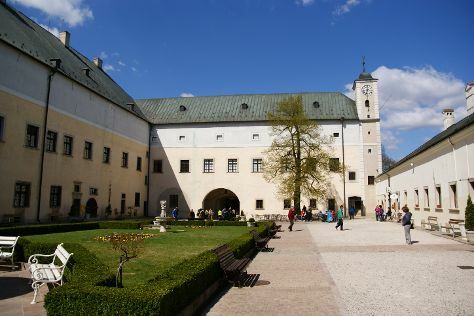 In the 16th century it was expensively rebuilt into renaissance fortress with low courtyards. It was continually fortiefied and maintained during the 17th century, when new cannon bastions were built. In 1706 it was damaged by army and so became dilapidated in the 18th century. The remains are visible from surrounding environment, part of Zahorie district can be seen from the remains. Water font is located near the remains. Plavecke Podhradie is in Bratislava Region. Find what you're looking for from your Plavecke Podhradie holiday, by planning the whole thing with us using our handy Slovakia trip maker .